The first instruction – MOV P0 #83H – is to turn LED off (Hex 83 in binary = 10000011) and to initialize switches 1 and 2. Switch 1 is connected to port 0.0 and switch 2 is connected to port 0.1. Also note that LED is connected to port 0.7. This is correct but i dont understand why don’t any website gives this ISR in c language. Can you provide same isr in c? It is basic for my son. Please provide c code for this interrupt, So i can get logic for my circuit. I am using IR slot sensor for interrupt to P89V51RD2 . I have designed cross road traffic signal control system with that i am showing if a vehicle passes by night sensor would sense and road light would be turned on. The prob I am facing is once the prog goes into ISR the main prog i.e. traffic lights gets stuck. Please advice I want the traffic lights should continue just the road lights should be turned on for a specific time. something like crystal is used in circuit can i know what it is and how it works. kindly possible to provide c code. Can anyone please help? can i make a program that does something when i press a push button for some time? 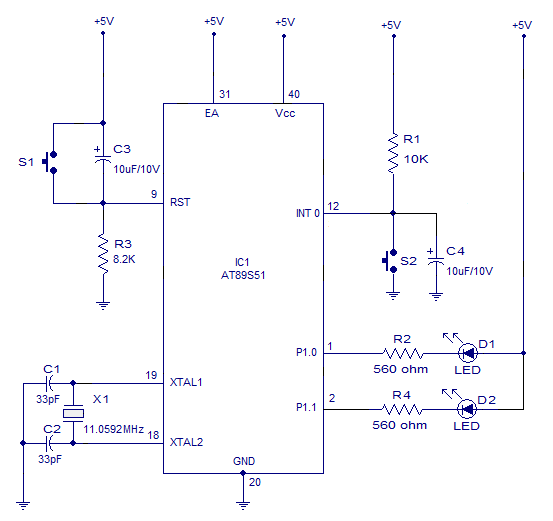 In this circuit why have you used two switches to enable the LED. It could be easily done by using software coding..
led1 led2 and switch1 and switch2 on/off run by 8051, led1 on/off by switch1 and led2 on/off by switch2,code by asm51. in thetoggling LED,s circuit the LED,s should be connected with ports 1.6 and 1.7 then thay will toggle with interrupt. at 1.0and 1.1 every time the samepattern is applied so they will not lit alternately. if i am right please inform if not then too…..
please cmmnt in urgent need of help..
can u please post a project that gives numbers with ten push buttons and 3 leds plzzzzz…..
Any one can devlope circuit for 96 keys for electronic piano for me. It should be capable for 12 keys(max) press at a time , i.e. multi key press event. I appreciate this is here for learning. you have some nice articles. but in order to achieve ‘LED ON OR OFF’ all you need is a latching spdt and the LED. This does not explain the need for all this circuitry.. and i would like to see an example of where this might be useful to me in the future. also it seems to me c3 and r3 create a ‘de-bounce’and are not just “part of” the reset circuitry. this is worth noting as is also useful in other circuits. what is an example use for this circuit? @wilson – This article and circuit is for learning! – Learning abt interfacing LED and push button switches to 8051 micro controller.